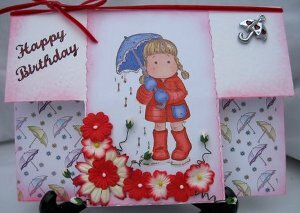 The smallest of gems can add that special something to a finished card. Sometimes when you think a card is finished it seems to lack that... "certain something". You can't quite put your finger on it....but you know it just doesn't look right. Two or three gemstones in strategic places can all make the difference. Place them dry, wherever you think they would look good, and when you are happy with the result glue them in place, permanantly. Then stand back and admire your handywork. Pleased? Yes of course you are! Try making some Crochet, Punched flowers, or Acetate ones for a different kind of look. And don't overlook the addition of some Skeleton Leaves. These flowers are small mulberry ones, and the rain in the puddle at the childs feet is "Glossy Accents". Don't forget to browse the internet as well for other treasures, and try the craft fairs that visit your area. Look for ribbons, and use the shorter lengths to make a Ribbon Flower. 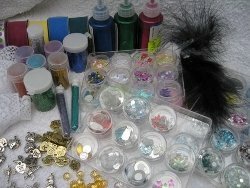 Look for Lace, silk leaves and Feathers and start keeping Buttons as a cheap way to add decoration to your cards. And for a fun look add Googly Eyes. Another lovely addition to your cards comes in the form of Decorative Pins which can really make your "Special" cards stand out from the crowd. Look at what you have to weave a few magic spells of your own.